Isshin-Ryu is a style of Okinawan karate founded by Tatsuo Shimabuku and named by him on 15 January 1956. Isshin-Ryū karate is largely a synthesis of Shorin-ryū karate, Gojū-ryū karate, and Kobudō. Isshin Ryu Karate is summed up in its kata, or formal practice methods, and the specific techniques used to punch (vertical fist) and kick (snapping kicks). In many of the various forms of the system, sixteen kata (eight empty-hand, three bo, two sai a bo-bo kumite kata, a bo-sai kumite kata and one tonfa kata) are agreed upon as composing Isshin-ryu. 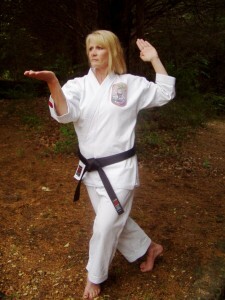 These Kata include original developments of the Master, and inherited kata from the parent styles.